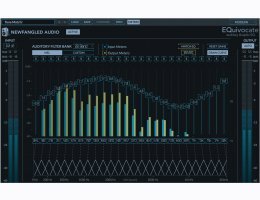 Perfect for mixing and mastering, EQuivocate uses filters which are modeled on the human ear. Each of the 26 critical bands tickles a different part of your inner ear, making any combination of settings sound as natural as possible. Combining this with a linear-phase filter shape that reduces pre-echo makes EQuivocate an EQ with a difference you can hear..
Use EQuivocate’s Match EQ feature to help make the sound of your track match or complement the audio signal streamed to its sidechain. You can also use it to make a final master match the tone of a reference track, or help fit sound into a dense mix. Unlike other match EQ plug-ins, EQuivocate provides a practical match without trying to model imperceptible differences which can cause a match EQ to sound unnatural.Feed your favorite song or individual track into it and instantly morph your tone to match..
Eventide uses PACE’s iLok licensing system, with or without an iLok hardware dongle, to license plug-in products. Includes artist presets from Richard Devine, Jeremy Lubsey, Alex Saltz, Sebastian Arocha Morton, Richard X, and John McCaig. Choose your own color scheme for your viewing pleasure.